Monochrome photograph of Abden which became Ross Hostel and then Ross House. It was built by Robert Hamilton Bruce who built and owned 'The Grange', which became the Royal Golf Hotel. This photograph is incorrectly annotated 'The Grange' in the album of postcards and photographs taken by Mrs J.I.C. Mackay of Dornoch and its surrounding area. 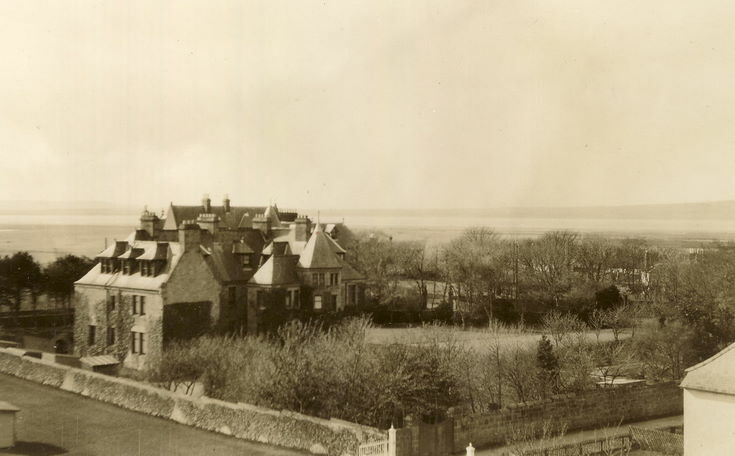 The roof line of 'The Grange' or Royal Golf Hotel can be seen seaward beyond Abden. That's Ross House again with the Station Hotel entrance and grounds in the foreground. The Grange or Royal Golf is the roof you see beyond Ross House.